Fourteen years ago, I spent another Memorial Day saying goodbye to my grandfather. V. E. “Red” McGee died May 27, 2000 from cancer. It always seemed rather fitting to our family that my grandfather was buried on Memorial Day that year. 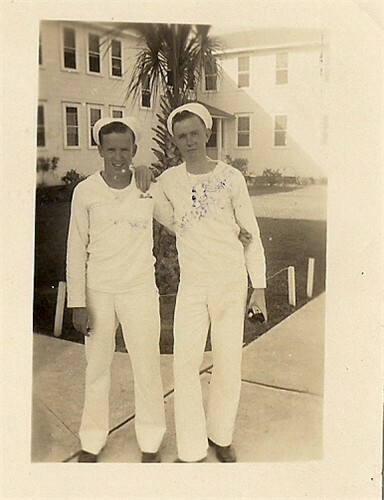 He was a WW II veteran, having enlisted in the Navy with his parents’ permission shortly before his 16th birthday so that he could be stationed with his older brother. My grandfather would have likely laughed at his own funeral service. As a veteran and member of the local VFW, he had a flag draped over his coffin. Toward the end of the service, several veterans came forward to fold the flag and present it to my grandmother. They solemnly removed the flag and began to fold it, but halfway through realized it wasn’t going to end the way it should look. The veterans unfolded the flag and began to fold it again, only to discover they had the same results. I’m not sure how many times they folded and unfolded and folded that flag, but it seemed to go on forever. Somehow, those men finally got around to getting the flag folded. And each time I remember the scene, I giggle a little and somehow feel it was fitting for my grandfather who loved a good laugh while he lived. Today is Memorial Day. It’s a day of remembering, especially those who served in our military and honoring those who gave their life. Like so many days throughout the year, I think about my grandfather on Memorial Day. He was veteran, a proud American. a family man, a hard worker who lived a full life. More importantly, he was a man of faith and I’m blessed to have been his granddaughter. Who are you remembering today? How is their memory a blessing to you? In Canada we remember our veterans In November… and then I think of my oldest brother who only passed away about 3 years ago but he served in WW2 in the RAF ….